Aero Tech Designs put this jersey together for our product testers who wanted a racing type jersey that is snug, with light compression. This is part of our Premiere Jersey collection that was developed to address the needs of a competitive cycling team. Always good for a weekend club ride, the peloton jersey is crafted from a combination of fabrics that are highly technical. The microfiber polyester yarns are tightly knitted for the wicking sweat away and keeping cool on hot days. The sleeves fit to the shoulders perfectly and comfortably. Available in sizes X-Small to 3XL and crafted with pride in the USA. 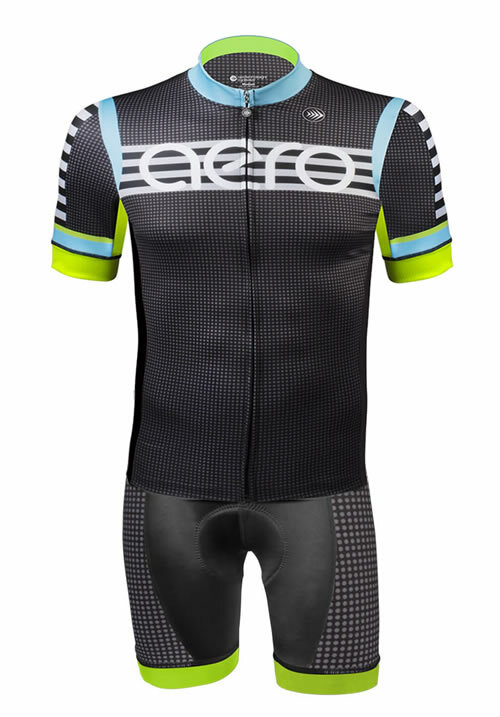 The Aero Tech Elite Racing Jersey - After rounds of research and development, Aero Tech Designs has developed the perfect jersey for training, racing, and style on your bike. The perfect blend of aerodynamic tailoring and top of the line fabric make this jersey fit to be called elite. Designed for the cycling position, the set-in sleeves of the Premiere Jersey create a beautiful fit from the neck and shoulder to the bicep. This gives the Premiere Jersey an aerodynamic advantage by fitting tight against the rider's body allowing air to flow freely over the body and eliminate air pockets in the fabric. To help manage moisture and keep body temperatures down, this Jersey is designed with honey-comb, carbon infused side panels. The extra cooling on the side panels and arm pits create a cool garment for summertime races and hard workouts. The carbon, honey-comb textured side panels start at the underarm and continue to the bottom of the jersey. Additional visibility with the fluorescent yellow ink and 3M reflective element below the rear pocket. Another value added quality of this garment is the 3M Scotchlite™ Reflective Material which is sewn in a key location on the back of the jersey. The Aero Tech Designs Power-Cuff is crafted from honey-comb micro mesh material. The Power-Cuff allows muscles to flex during effort but does not bind or restrict muscle movement. The cut is slightly longer so it stays in place and never looks like a muffin top. 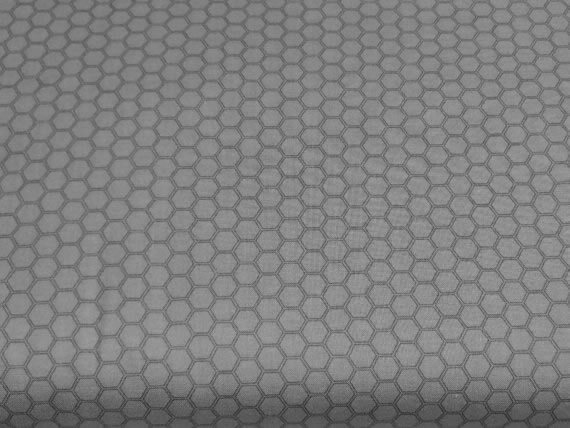 Honey-comb fabric has carbon infused fibers knitted-in to help vent heat buildup and enhance ventilation. The jersey was a race fit, perfect color and are great with the shorts I purchased earlier. These guys make some great stuff! One of my favorite jerseys. Love the fact they are made in the USA with local materials! This is the second Premier Cut jersey by ATD that I own and both are great jerseys. I will be getting more in the near future. The fit is great and the material and construction is high quality. I also like the design and feel that it looks better than most other bike jerseys out there. I use the jersey with both bibs and shorts and the cut of the shirt and the silicone gripper of the shirt hold the shirt down and I have no issues with it creeping up throughout the ride. This was a big step up for me after having worn a Bontrager and Castelli jersey before! I bought this set first because their products are made in the United States and I lived out by Pittsburgh while in college. Second, I really liked the colors and I wanted a form fitting jersey. I took my measurements and went off their sizing chart and it fit perfectly! This was huge since other brands sizing charts are way off. I was so happy with the jersey and bibs that I bought the red and black similar set. I have had alot of run ins with bad sizing charts online with cycling jerseys. Not here, I used the size chart and what I got in the mail was exactly what I ordered. The jersey fit perfect, feels great on the skin and super light for those hot days out on the road. 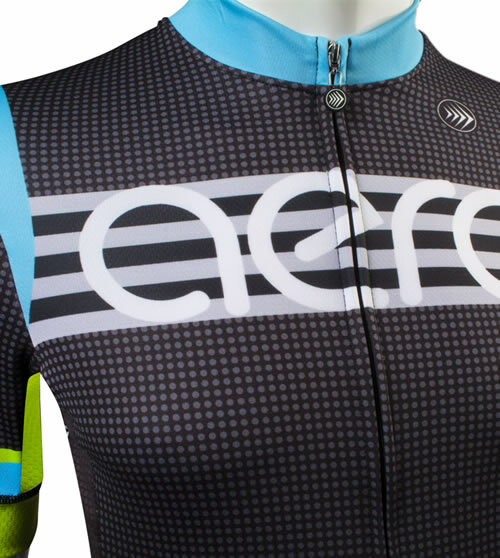 Highly recommend Aero jersey's will bet ordering another jersey real soon. The fabric is excellent. It feels like a race jersey but with comfort. The stitching quality is excellent and the cut is spot on. It's tight fitting without constriction. I have worn this for a 145 mile ride with 11,000 feet of elevation gain in 105Â° temperature. It felt fantastic after 7 hours. I highly recommend this jersey and along with the bibs. I would like to see a small side zipper pocket for cash or credit card.